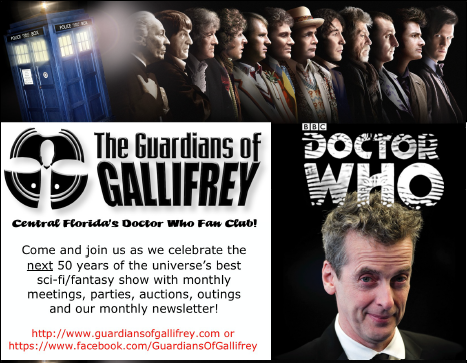 GOG: *32+* YEARS OF DOCTOR WHO CENTRAL FLORIDA GOODNESS!!!! Spend Easter afternoon with us at SCI-FI-CITY Doctor Who, Chat, Show &Tell, and more. Join us! [Find our Event Announcement at our Facebook site too! And his team at OFF WORLD VIEW! From June 2016:The Crew playing Character Headbands Improv at last year's Anniversary Party (*30*)! November 2009: A club skit written by Member Herby Ragan ('Dr.Evil')! 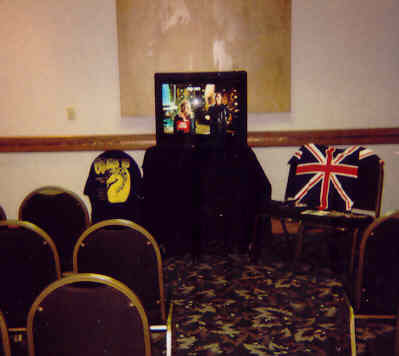 Seen here behind the sofa, Ken Spivey (THE KEN SPIVEY BAND), Allison & friends! Great time had at WHOSTOCK on 11/2013! Big thanks to Lisa Blue (The one with the Banana!) and the staff at The Winter Park Public Library! Edward, Jackie and Sam with GOG's Tardis,at ACME's Doctor Who Holiday Art Event on 11/23/2013! Please submit articles/pics/etc for Monthly Newsletter, THE GALLIFREY GUARDIAN, to Current Editor Bob Brinkman: His email is " Ceronomus@comcast.net "
Use PayPal via the Button Below!